With today’s advanced technology vehicles of just about any size, vehicles are faring well in crashes leading to many countless lives saved on the road. Some of the latest IIHS (Insurance Institute for Highway Safety) crash tests have really pushed the envelope in some extreme circumstances to put cars to the test. 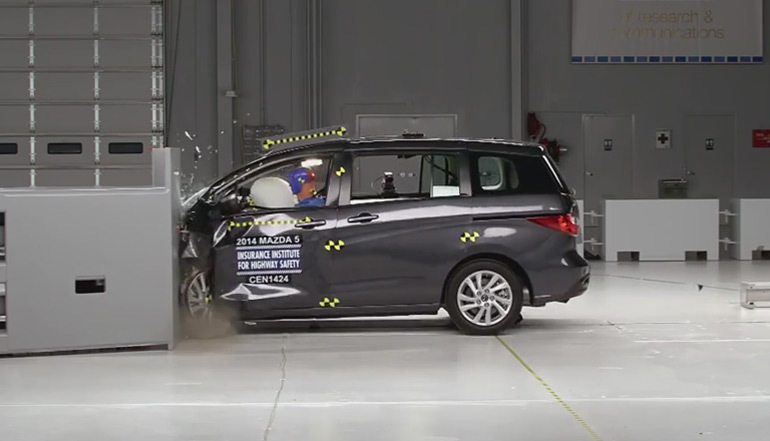 One test that has really raised some eyebrows is the overlap crash test, where the vehicle is subjected to a frontal collision at 40 mph but colliding only with 25% of the vehicles front end on the driver’s side striking a 5-foot-tall ridged barrier. Just from the footage alone you can see how detrimental this test can be. Fortunately, the majority of small vehicles fared well in the small overlap crash test. However, there are a few small cars that faltered in the tests as demonstrated in the video below, such as the Fiat 500L, Nissan Leaf, Nissan Juke and Mazda5 getting a Poor rating. The Chevrolet Volt, Ford C-Max Hybrid, Mitsubishi Lancer, Scion FR-S, Subaru BRZ received an Average rating and the Hyundai Veloster and Scion xB scored Marginal.